"...perhaps, on the other hand, it all began not imitatively but by someone adding one bit of a soft strip of bark, sinew, vine or whatever, to another, fastening them together in various ways, experimentally, not aiming for any immediate application." Well, it is full confession time. We are big suckers for beautiful weaving. Weaving has this wonderful history, it is the history of textiles that is also the history of human civilization. 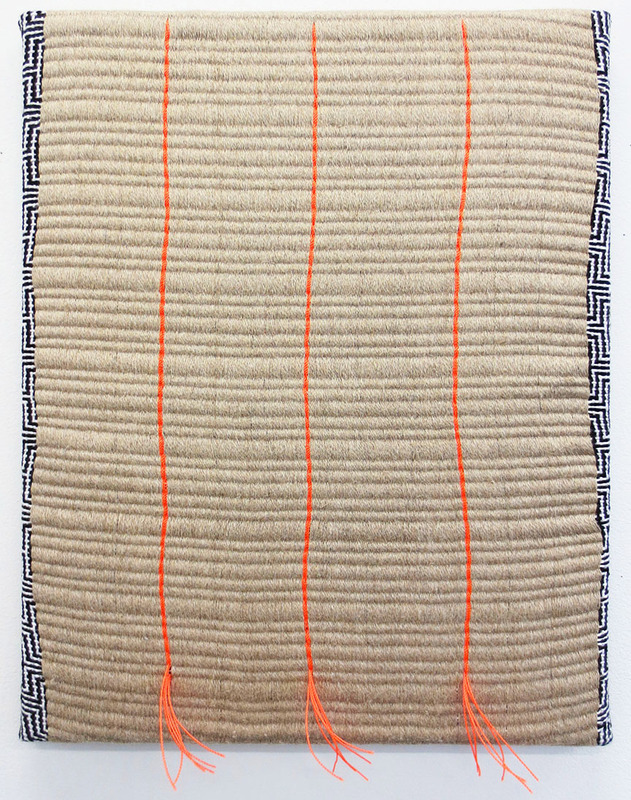 And as prelude to our interview with artist Samantha Bittman, we thought we would delve briefly into the history of woven textiles, The Bauhaus, the foresight of Haystack Mountain School of Craft, and into the work of a contemporary artist weaving her way. For those who love textiles, you can argue that your love is genetic and something that has evolved with the evolution of human civilization! Textile crop cultivation, in the context of Europe's history, is estimated by archeologists and scientists to have reached relatively sophisticated systems for nettle, flax and hemp cultivation in the Bronze Age. Which is to say that the importance of producing natural fibers that could be produced into clothing goods or otherwise was developed to such a point by the end of the Neolithic period that communities were striving to produce on a level that not only sustained their localized needs but acted as potential raw material or goods for trade with outside groups. Increasingly, archeological evidence points to this kind of trade having had further reach than previously assumed. When we consider not only the evolution of agriculture and technology but the evolution of trade and regional economic development in early human civilization, textiles/fibers plays a critical role. In fact, textiles were are a currency traded before coin currency. If we consider luxury as a concept that evolves in relation to the scarcity of a resource, the specialized labor needed for processing the raw material or the technical skills needed for assembly, complex social paradigms begin to emerge. The production of wearables, bedding, structural coverings, ritual garments and every other application for woven goods was a large sector of labor for early civilizations. However much of our understanding of what was considered high status items in a society comes from burial sites and understanding the everyday woven items most intimately used is an emerging history still being written. Unfortunately for a long time in early archeology, textile artifacts were not collected or efforts made to preserve them, if they were not made of what was considered at the time, presumed high-status items or made of precious materials. As a result, today specialists take great care with all artifacts to try and fill in bits of history that have more to do with the everyday than the treasured. I know readers are probably wondering where this is going and how it relates to Samantha Bittman but in the spirit of asking for your forgiveness instead of your permission, there are a few more interesting matters to discuss. The Bauhaus. Leaping ahead in history, skipping over the history of Medieval and Renaissance tapestry and putting aside for a moment the revolutionary invention in 1785 of the "Power Loom", the first mechanized loom. The Walter Gropius era of the Bauhaus, with Gunta Stölzl, Johannes Itten, Wassily Kandinsky, Paul Klee and various other major figures, is still a captivating moment in the history of craft, art and design where the convergence of thought and practice manifested into an experimental incubator producing waves that surged through the weaving workshop. The weaving workshop was one of the more successful workshops at the Bauhaus despite it's lack luster leadership in the beginning that left the students to teach each other with Stölzl an anchor among the other students in the workshop. A central nebulas of weavers such as Stölzl and her student Anni Albers among others, delved into abstraction and experimentation of woven construction, synthetics, color and material investigations that relied not only on examining ancient remnants and historical works but synthesizing the concepts being taught by Itten and Kandanisky into woven practice. From a technology standpoint, when the Bauhaus moved to the Dessau campus, the facilities were vastly improved and jacquard looms that allowed high-production runs were implemented into the weaving workshop by the then weaving workshop leader Georg Muche. Stölzl officially became the form master and master crafts person of the weaving workshop in 1927. It becomes clear in looking at the trajectory of the weaving workshop at the Bauhaus that Stölzl begins to make a concerted effort to remove the associations of "women's work" from the workshop and use the language of modern art and industrial design to full effect by 1928. There are influences that would have placed this pressure on the weaving workshop as priorities of the Bauhaus switched from expression to design concepts of simplicity and functionality. In this short period of time at the Bauhaus before Nazi pressures overwhelmed the school's autonomy, the weaving workshop produced works that to this day bear a great deal of inspiration to artisans, artists and designers. 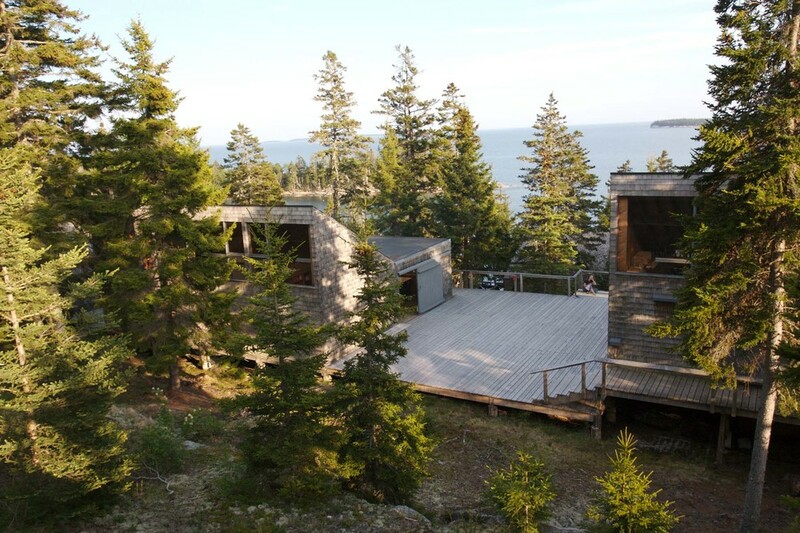 Images courtesy of Haystack Mountain School of Crafts. Today, places such as Haystack Mountain School of Crafts are renowned for their early adoption of a digital fabrication facilities also known as a FabLab into their overall vision of the craft school program. The Grassroots Invention Group and the Center for Bits and Atoms program collaborated to launch the fab lab concept in 2001 at MIT with the leadership of visionary Neil Gershenfeld. In short, a FabLab is a small-scale lab for personal fabrication using CNC technologies such as a laser, milling machine, vinyl plotter and a 3D printer. 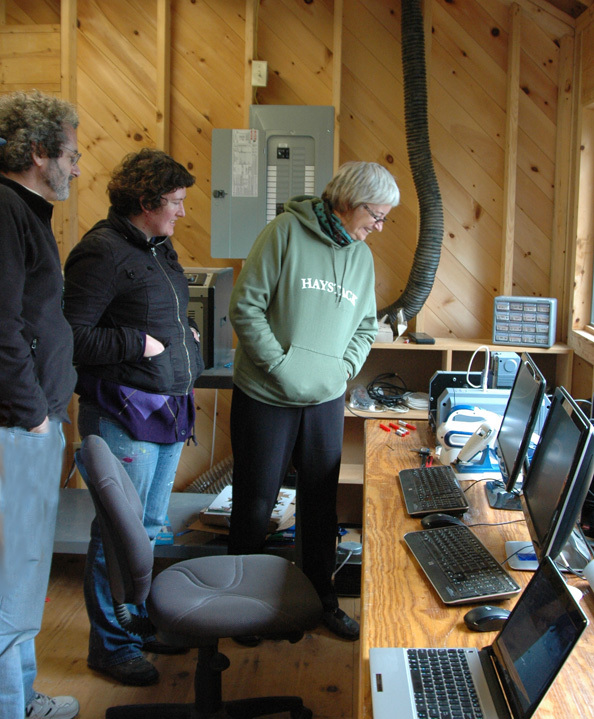 In 2009, Haystack invited Neil Gershenfeld to their campus which sparked Haystack to the put together a FabLab of it's own that serves not only the school but the local community as well. Much of the beauty of Haystack's early adoption of the FabLab concept is the fact it successfully bridges the inherent technical skills and material knowledge of it's craft community by augmenting their workshop offerings and residencies with experimental use of their FabLab technologies and fostering awareness and access to their local Maine community. And this is where we come to Samantha Bittman. For those of you who have explored the Knotwe website, you have seen the wonderful FabLoom video . While a weaving instructor at Haystack in the summer of 2013, Bittman collaborated with the FabLab technician Elliot Clapp to make a very basic loom that was cut from prepared files by the laser out of wood. Bittman is one of many artists in schools, residencies or in the proliferating number of community FabLabs popping up internationally, representing an ongoing common place of creatives experimenting with technology and finding new outlets and tools for making interesting work. The FabLoom is not the most efficient way to weave, but it is a quirky fun piece that resounds a reoccurring theme in that making and experimentation are boundless. As we see more new machines develop and even possibly transform our creativity into personal manufacturing, our ideas about configured boundaries between craft, art and design will continue to morph and need each other. Indeed, the woven textile will always be beautiful and will continue to evolve with technology and be inspired by many sources. It's in our DNA. Samantha is a skilled weaver who utilizes not only a brilliant understanding of drafting and weaving skills but she has a clear understanding of painting. In fact, she considers her pieces paintings. She does not site her inspirations but indeed her works are so optically striking that her understanding of pattern and color undoubtably reference an understanding of Op-Art, recall the on the bias fabric works of Louise Bourgeois, the installations of Polly Apfelbaum and yet in quieter moments, Samantha's dedication to line, repetition and proportion harkens the works of Agnes Martin. This is what makes Samantha Bittman's work resonate with energy and exuberance. She is able to take many elements bring them together and make them shine. 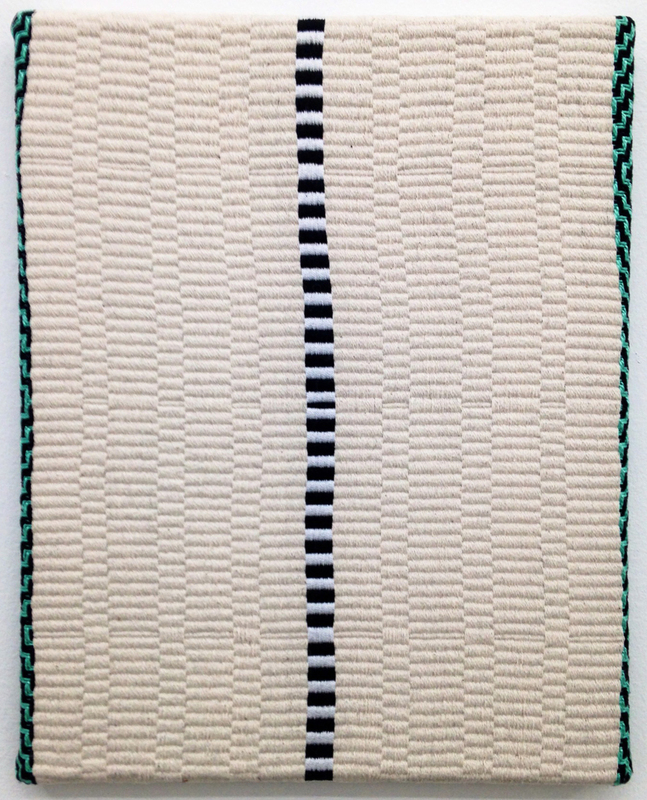 Untitled, 2014. acrylic on handwoven textile. 12x10. Courtesy of the artist. Haystack received a grant this year to create a new video for the school. Photographer and multimedia producer Amanda Kowalski spent a few days on campus this summer videotaping for the project. The accompanying music is by Paugus. http://www.ted.com MIT professor Neil Gershenfeld talks about his Fab Lab -- a low-cost lab that lets people build things they need using digital and analog tools. It's a simple idea with powerful results. Knotwe reached out to Samantha to learn more about her work and her experiments at Haystack. 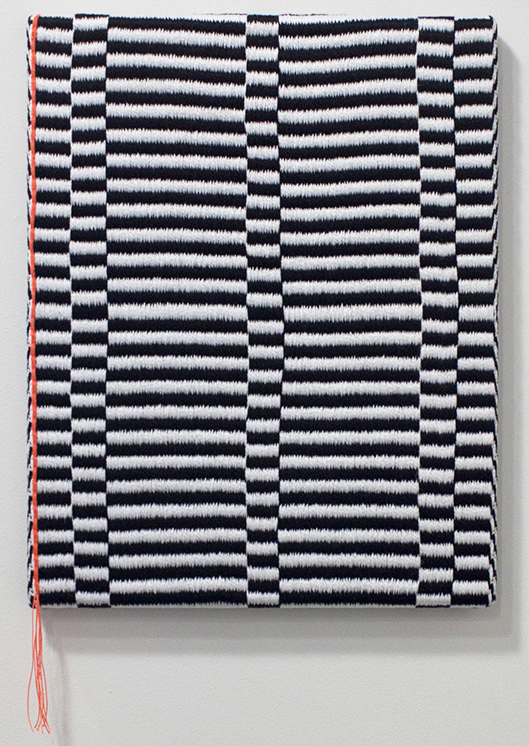 Untitled, 2014. acrylic on handwoven textile, 25x20. Courtesy of the artist. Q: I can see how your work would very effectively draw viewer's in to the detail of the work. When you are preparing a new piece and drafting your weave pattern, what are the primary objectives that you find yourself continually returning to (i.e. contrasting textures/surface treatment, optical issues via pattern and color) ? A: I use a lot of weaves that generate contrasting patterns, such as "color and weave", as well as weft faced weaves- where the weft yarn covers the warp entirely, creating a ribbed texture and solid blocks of color. These two approaches highlight different aspects of the image to me, graphic and textural, which I find relevant to making paintings. And, yes, I do aim to draw the viewer in to the examine the surface closely. In weaving there is always the structure of the weaving itself creating the pattern, or this inseparability between the image and the object, which you need to see close-up to understand and figure out. During Session 5 this summer (2013), Elliot Clapp, a fab lab technician, and Samantha Bittman, the weaving instructor, created this video with Samantha demonstrating how to use a hand loom, which she and Elliot designed and created. Q: Knotwe first became aware of your work through Haystack and the FabLoom that you co-created with Elliot Clapp at Haystack while you were the weaving instructor there for the summer 2013 session. How did you find the Haystack FabLab experience? What attracted you to be part of Haystack? A: The FabLab is amazing. Elliot and I were able to quickly work through many variations of loom prototypes. This was because we were able to work on the computers and fabrication equipment directly, without having to translate our ideas through middle person. Sometimes, we would literally just stop the laser cutter mid-cut if we saw something that wasn't working out or could be improved. The other aspect of this relationship to making that was crucial was to be able to understand the limitations of the tools and the technology through our own experiences of making, and to therefore improve the design based on this knowledge. I think this type of realtime feedback is a primary aspect of what craft is, and why the FabLab fits so perfectly with a school like Haystack. I would love to go back and spend more time working in the FabLab one day. Tiles Installation, 2013, Okada Sculpture Facility, Bemis Center for Contemporary Art, Omaha, NE, Courtesy of the artist. Q: Can you describe your inspirations for the tile installation you did for the Bemis Center for Contemporary Art? Did working with the tiles impact your weaving practice or thoughts on materials you want to work with in the future? A: I wanted to make something at a larger scale than the paintings and also something that wasn't bound to the parameters of weaving. The tiles are individual 2" blocks of MDF which I spray painted in various colors. Each tile is handmade- cut, sanded, and painted, which is important to me, and while quite simple in form, making the tiles was still a laborious process because there were just so many of them. So there was this relationship to textile, labor, and making, as well as the image/object relationship. The idea was to have these modular pieces that can be arranged into different patterns depending on the space. At Bemis, each configuration was based on a different quilt motif from the 1974 Pieced American Quilt Exhibition at the Renwick Gallery. Also, while in Omaha, I visited the International Quilt Museum in Lincoln, NE, just a one hour drive from the Bemis, and there there was a show of quilts by Ernest B. Haight, which was incredible and informed the work. Q: In December 2013 Hyperallergic named you as one of nine artists to watch after your showing with the Andrew Rafacz Gallery at the Miami Art Fairs which is pretty awesome. What recent experiences do you feel have helped propel your career? A: A big thing for me after grad school has been to keep pushing to prioritize having time to be an artist- as opposed to the thing I do after I do all of the other things. This has been slow and gradual, but the more time I have for myself, the more I can develop my work. The Hyperallergic write up was awesome, and definitely exposed my work to new people, however like many others, I don't necessarily buy into those types of lists. 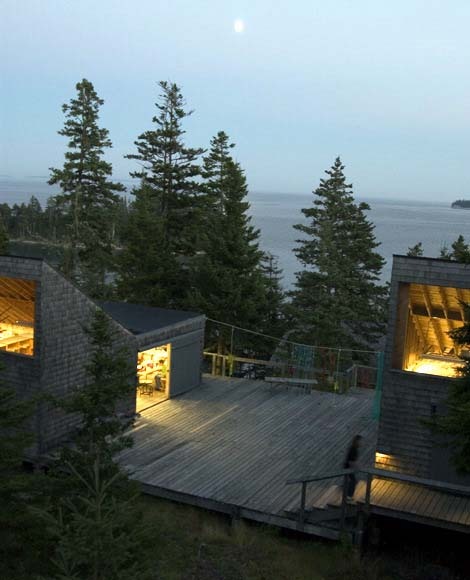 Other experiences that have been a catalyst of sorts would definitely be artist residencies. The Bemis residency was most recent and pretty major for me because it was so long and I was supported on many levels- financially, technically, and emotionally. Q: Advice you have for artists just starting out? A: Trusting your gut is a big one, and sticking with it.